The first thing I did was brine my turkey. Tuesday evening I took the mostly thawed turkey and placed in a large stock pot ( you can buy brining bags if you don't have a large enough pot). In a large saucepan I added 1 gallon apple cider with 1 cup salt and 1 cup of sugar. Then I placed a handful of black peppercorns, a tablespoon dried rosemary and thyme, and brought the mixture up to a simmer to dissolve the salt and sugar. Then I added 1 gallon of Ice water to the stock pot, along with 1 sliced lemon and the cider mixture. Sorry I have no pictures of this, I did it at my parents house. Refrigerate for 24 hours. 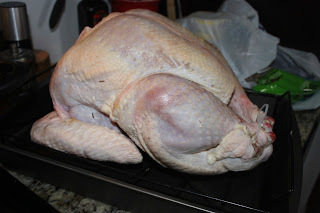 Then take your turkey out, and rinse under cold water, inside and out of the turkey. Place on baking sheet and dry with paper towels, inside and out. Let dry overnight. Thursday morning taken your dried turkey, liberally salt and pepper the skin. 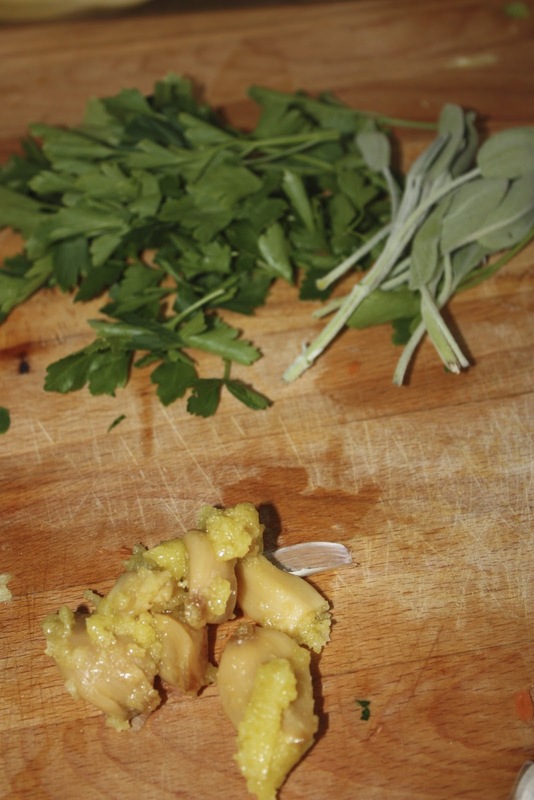 Place cut celery, onion, and lemons inside cavity, along with leftover parsley stems. 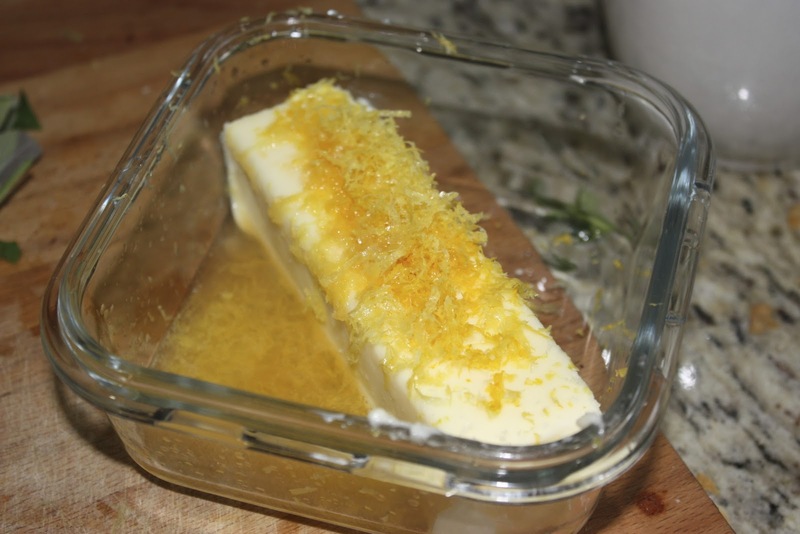 Then take 1 stick of room temperature butter and mash 3 roasted garlic cloves, 1 tablespoon each chopped sage and parsley, and the juice and zest of 1 lemon and mash together. 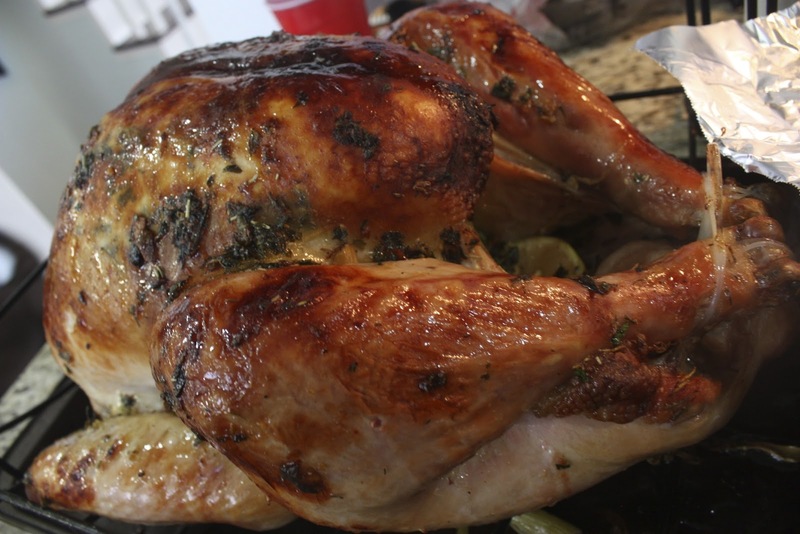 Pull the skin from the turkey breast and smear the compound butter mixture in between breast and skin, going as far down the thigh as you can. Then take remaining butter and spread on the outside of the bird, all over the beasts, thighs and drumsticks. Place in roasting pan with rack. Pour 32 ounces of stock (turkey, chicken or vegetable, whatever you can find) in the bottom of the roaster, along with 2 chopped carrots, onions and celery stalks. Add 1/4 cup white wine to pan. I was also making stuffed mushrooms as an appetizer, so I added my mushroom stems to the bottom of the roasting pan to deepen the flavor of the pan drippings for my gravy. 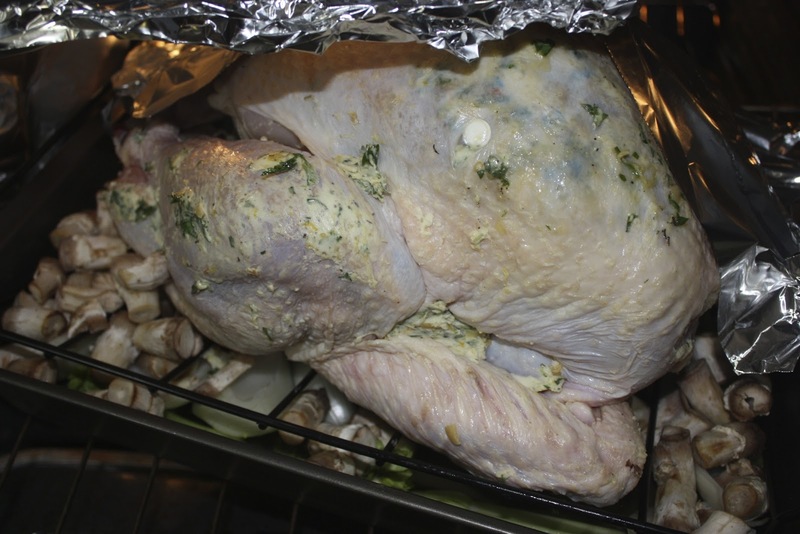 Place tin foil over the top, tenting the turkey in a 325 oven. You'll cook the turkey 15 minutes per pound, but the last 45 minutes remove the foil to brown the skin. 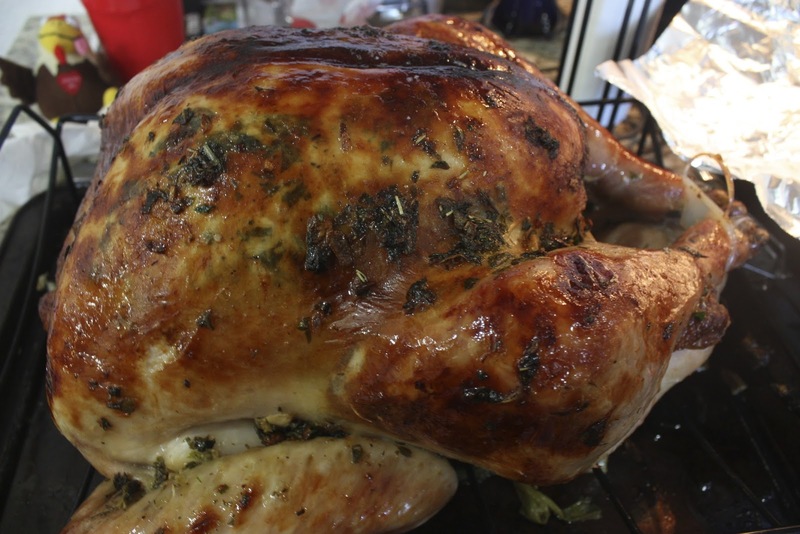 Check with thermometer in thigh to reach 165 degrees, the remove from oven, re-tent with foil and allow to cool for at least 20 minutes.